The Honolulu Police Department and Department of Facilities Maintenance under Westley Chun and the Office of Housing under Coordinator Trish Morikawa raided (de)Occupy Honolulu this morning around 8.30am. This is the 19th raid in the encampmentʻs 198 day history of continuous encampment at Thomas Square. 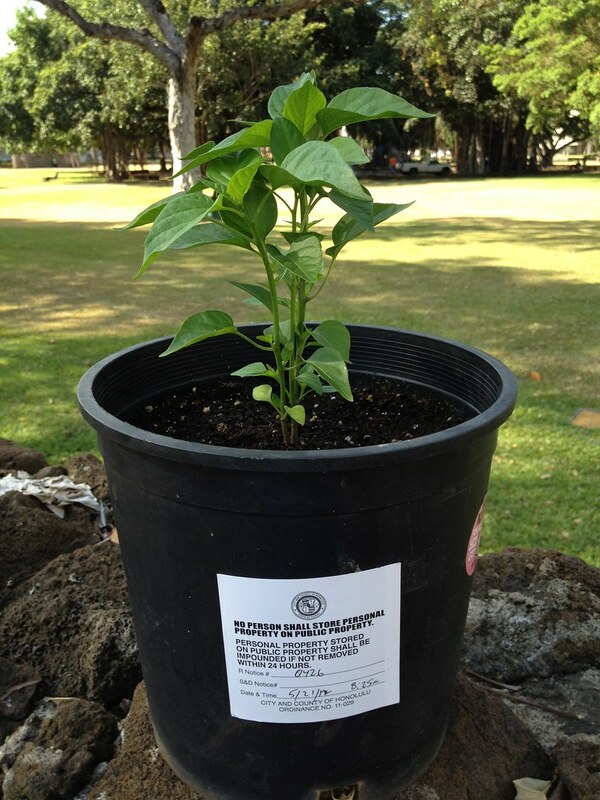 The tag on this plant means that it is subject to seizure 24 hours from now when (presumably) the Honolulu Police Department and Department of Facilities Maintenance will return with dump trucks to trash the place once more. They have trampled, dug up, or seized all plant life the encampment has attempted to grow. The City has taped off the area with crime tape during the last three raids, while blocking two lanes of traffic to provide access to the area for dump trucks and back hoes. Will they do this again tomorrow (Tuesday)? Stay tuned. Encampment participants continue to protest the Cityʻs use of armed force against peaceful protest, the continued violation by the City of the Law of the Splintered Paddle which clearly protects the houseless, and the continued violation of the protections of the First and Fourth Amendments of the US Constitution which are reiterated in the Hawaii Constitution.